Last week played out almost too perfectly, as the market almost seemed to be following my chart, instead of vice versa. There are only a few things to add over what's already been said in prior posts. My preferred count is still that we are in v-down of minor (1), with 1-down, 2-up complete. The move appears to be subdividing for the 3rd wave down, as anticipated. At this point, I would expect a wave (2) rally to take us back up to test resistance in the 1174 area, and possibly as high as the gap at 1187. 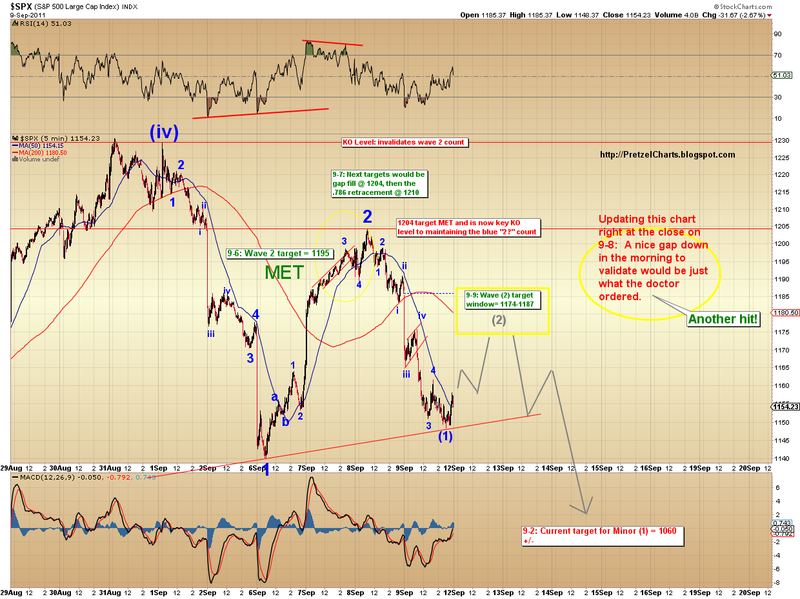 After that, I would expect a strong reversal; wave 3 should see stronger selling pressure than wave 1 did. I would be very cautious about holding longs overnight in this environment since the market is likely to gap down one or more times during the 3rd wave, which could start at any time. Personally, I don't trade counter-trend during nested 3rd waves, as they can be very unforgiving to people on the wrong side of the trade. So far, there's been nothing to cause me to alter the target I set a couple weeks ago for wave v of minor (1) to bottom in the 1060 area. We'll have to see how the 3rd wave structure unfolds, and I'll alert you as soon as possible if I feel the target might need to be adjusted. 1204 is now the key level to maintaining this count, and an upward violation there would tell us that the triple-zigzag alternate count is probably unfolding. Given the action last week, I don't anticipate that level being broken until this wave is complete, but stranger things have happened. Do you see the divergence on the RSI on Friday, with two higher lows while price dropped to count (1) ? Yes. I guess I don't always highlight the divergences -- I highlighted the other two to help determine wave labels as the counts unfolded, since the counts were a little trickier -- and I'm one of the few, if not the only, technician to mark IV as ending at the lower high. The decline off 1204 was a lot cleaner and RSI confirmation seemed redundant. What were your thoughts?